Preface: This is an opinionated guide on creating a clear and concise API for people consuming your React Components. These conventions have served me well and I hope they help you. Keep propTypes as minimal as possible. Long long prop names are bad news. Don't make things short for the sake of making things short. The prop should still convey meaning to the consumer of the component. Listen buddy, React doesn't give you license to reinvent the DOM API. If your prop is applying directly down to a native DOM API, call it with the same API. This will help new users of your component to not wonder "WTF does this prop do?" they will simply know because they know HTML. This one might be controversial, but my reasoning here is that far more developers are familiar with DOM than with native iOS/Andriod/Whatever conventions. camelCase your propTypes. Many camels died to give you their case. Use it. For boolean props, use isOpen, hasValue, canExecute etc. For function props, use onClick, or onCustomEventName. For array props, use plurals. By adding comments above prop types you achieve two things. You can now automagically generate documentation from your src. This is a no brainer. Automatic doc generation FTW. When creating configurable components, a natural gut reaction is to expose all the things! 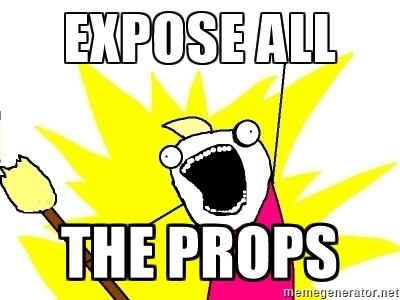 Once you expose props, you can't ever remove them in a backwards compatible way. You will need to support and map deprecated props to new ones or risk breaking consumer's UIs. If you allow for sprawl to occur, your component API will be massive and the consumer of the component will need to read your "prop manual" every time they use it. Be diligent around this one. When wrapping third party libraries (like charts, maps, SDKs etc) in React components, try your hardest not to write new prop abstractions. If the third party library has a standard API and heaps of documentation, why reinvent the wheel? Leverage the already written documentation and examples so you don't need to create and maintain your 'better' abstraction. There are use cases where you DO in fact want to limit the underlying libraries functionality or remap some of the underlying API with more convenient props. Don't try and reinvent conventions and make people learn your newly invented DSL. isLoading: PropTypes.bool, // looks like a bool to me! onCustomAction: PropTypes.function, // looks like a custom event that takes a handler! Do you have any other conventions you like to follow? Do you disagree with any of the conventions mentioned in this post?